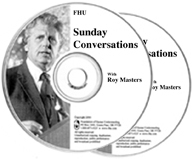 For 55 years, Roy Masters has helped many thousands of people find the true meaning of Christianity. Roy lives a simple, golden life and has helped so many find the same. Here, Roy tells the story of Christianity in a unique and very personal way. He starts with our metaphysical beginnings and carries the story to Jesus, himself and finally to your life. Find out why Roy’s life is so simple, and how it can be that way for you.